Om Norrlandsløk / Norrland Onion | Edimentals ! Day 2: 5 hour walk and foraging tour down the Homla Canyon. 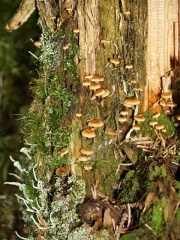 Anyone identify this fungus - early spring on a tree stump.